Sue Goyette was born in Sherbrooke, Quebec in 1964. She is the author of two books of poetry and one novel. Her first poetry book, The True Names of Birds (1998), was nominated for the 1999 Governor General’s Award, the Pat Lowther Award, and the Gerald Lampert Award. Selections of her work have won the 2008 CBC Literary Prize for Poetry, the 2010 Earle Birney Award, 2011 Bliss Carman Poetry Award, and the 2012 Pat Lowther Award. Goyette has taught at the Banff Centre for the Arts, the Blue Heron Workshop, the Sage Hill Experience, and currently teaches at Dalhousie University. 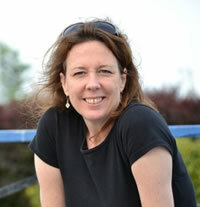 Gaspereau Press will publish her fourth book of poetry, Ocean, in 2013. She presently calls Halifax, Nova Scotia, home. not. Now you should have one big number on your hands. what that number represents, how it’s significant to you. or sneaking in. Isn’t it strange, eerie how it works out? Coincidence? of the square root of my spirit on several of the village walls. with a few treasured words by Rumi, but I couldn’t help myself. I’m still not sure I really get it. Published in Undone (Brick Books, 2004). Critical Analysis: Poetic Community and Belonging in "A New Form"
In her poetry, Sue Goyette strives to articulate the transformative nature of poetry and poetic community. Whether exploring familial relationships or the nature of the poetic process, a sense of loss pervades Goyette’s work. Her focus lies not only in the realm of poetic transformation, but also narrows to meditate on belonging and the act of writing. Such acts become integral to exploring the speaker’s transformation, serving as a means to exert control over one’s environment. Goyette’s “A New Form” reflects on the writing process as a way to ward off loss and instil a sense of belonging. Initially, Goyette’s speaker instructs “stretch out your arms / and measure the length of the tip of your right index finger / to your left ring finger” (2-4). The domestic nature of this image speaks to an initial sense of community in marriage, arguably marred by “the weight of your first true / sorrow” (4-5). With marriage now marred Goyette’s speaker retreats to the solitary act of writing. of the workshop. I went to the readings and heard masters recite (41-3). The speaker’s earlier losses are juxtaposed against a burgeoning feeling of belonging. However, due to the tonal shift as the book is being bought and the speaker is taught, the reader is forced to re-evaluate the entire poem as a result of this admission. With a new frame of understanding, it becomes clear that Goyette herself is commenting not only on the difference between domesticity and poetic community, but also on the space between. As her speaker closes the poem with the admission that “I’m still not sure I really get it,” (47), the hesitancy in belonging becomes apparent. As such, “A New Form” speaks not so much to a sense of belonging, but to a sense of self created through poetry. Aitken, Kelley, Susan Goyette and Barbara Scott. First Writes. Banff: Banff Centre Press, 2005. Print. Goyette, Sue. ​The Brief Reincarnation of a Girl,. Kentville: Gaspereau Press, 2015. Print. ---. "Cooked to Tears." Geist. 27.93 (2014): 26. Print. ---. "Fashion: a Blend of Shyness." Prairie Fire. 33.2 (2012): 67. Print. ---. "Fashion: for the Crossing." Malahat Review. (2012): 15. Print. ---. "Fashion: Grief Wear." Prairie Fire. 33.2 (2012): 68. Print. ---. "Fashion: Inspiration Wear." Prairie Fire. 33.2 (2012): 66. Print. ---. "From ‘Ocean’." Malahat Review. (2012): 14. Print. ---. “Full House.” Canadian Literature 166 (Autumn 2000): 62. WorldCat. Web, print. 6 Jul 2011. ---. Lures: a novel. Toronto: HarperFlamingo Canada, 2002. Print. ---. “Meadow.” Canadian Literature 166 (Autumn 2000): 125. WorldCat. Web, print. 6 Jul 2011. ---. “The moon on Friday night.” Compton, Anne, Laurence Hutchman, Ross Leckie, and Robin McGrath. Coastlines: the Poetry of Atlantic Canada. Fredericton: Goose Lane, 2002. Print. 128. ---. Ocean: Poems. Kentville: Gaspereau Press, 2013. Print. ---. “On Building a Nest.” Compton et. al. Print. 130. ---. Outskirts. London: Brick Books, 2011. Print. ---. Penelope. Kentville: Gaspereau Press, 2017. Print. ---. “The Peonies.” Compton et. al. Print. 129. ---, ed. Resistance. Regina: Coteau Books, 2018. Print. ---. “The True Names of Birds.” Compton et. al. Print. 128. ---. Undone. London: Brick Books, 2004. Print. ---, and Molly Peacock, eds. The Best Canadian Poetry in English 2013. Barrie: Tightrope Books, 2013. Print. Bast, Laura. "Sue Goyette’s Quagmire." Canadian Notes and Queries. (2015): 67. Print. Bird, Lindsay. "Deeply homesick for a woman's voice." Rev. of Penelope by Sue Goyette. The Coast, thecoast.ca, 14 Dec 2017. Web. 25 Nov 2018. Glenn, Lorri Neilsen. “Rev. of Undone, by Sue Goyette.” Antigonish Review 141/142 (Spring 2005): 179-185. Literature Online. Web, print. 6 Jul 2011. Goyette, Sue, and Linda Besner. "An Acquiescence to Not Knowing." What the Poets Are Doing: Canadian Poets in Conversation. Edited by Rob Taylor, Gibsons: Nightwood Editions, 2018. Print. Jackson, Lorna. “Rev. Of Lures by Sue Goyette.” Quill & Quire (2002). Web, print. Kruck, Laurie. “Rev. of Lures, by Sue Goyette. “ Canadian Literature 181 (2004): 138-140. EBSCO. Web, print. 6 Jul 2011. Lane, M. Travis. "Haligonian Charm: review of Outskirts by Sue Goyette and Open Air Binderyby David Hickey." The Fiddlehead. 251 (2012): 103-106. Print. Mikalson, Kaarina. "The Brief Reincarnation of a Girl." Rev. of The Brief Reincarnation of a Girl, by Sue Goyette. Dalhousie Review. 96.1 (2016): 135. Print. Queyras, Sina. "Women, Epic, Live Wires: In Conversation with Sue Goyette." LEMONHOUND3.0, lemonhound.com, 12 Dec 2017. Web. 25 Nov 2018. Webb-Campbell, Shannon. "Resistance is an Act of Poetic Power for Women." Rev. of Resistance edited by Sue Goyette. Atlantic Books Today, atlanticbookstoday.ca, 25 Oct 2018. Web. 25 Nov 2018.